Do you suffer from unsightly red thread veins? 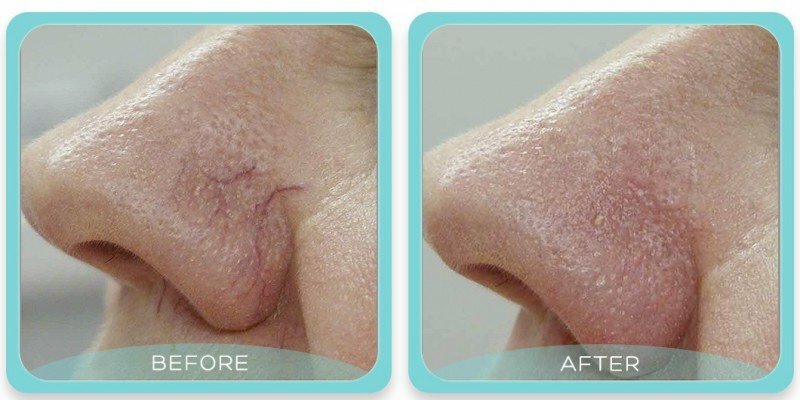 At Clinic 33 we offer ThermaVein, the instant, safe and permanent way to remove facial thread veins. Thread veins are also known as spider veins or broken veins, and medically referred to as telangiectasia. Why not book a complimentary consultation to discuss your concerns with one of our skincare experts? Call 0333 011 0680. Unlike most other broken vein treatments ThermaVein does not use IPL, laser or epilation, all of which have disadvantages and side-effects. Instead, Thermavein technology uses a microburst of current through the surface of the skin to trigger a process called Thermocogulation. This causes the vein walls to collapse and seal, and the thread veins disappear instantly. The treatment uses a fine probe for complete accuracy and optimal results. It is quick, relatively painless with minimal downtime, and safe for all skin types. There is no damage to surrounding tissue and almost no risk of bruising, scarring or change/loss in pigment. ThermaVein was developed in collaboration with Dr. Brian Newman M.D., FRCS the pioneer of a process called “thermocoagulation”. ThermaVein technology uses this process to seal thread vein walls causing them to permanently disappear. A form of high frequency microwave energy is individually delivered to each vein via a fine skin probe. Usually, discomfort is minimal – it has been compared to having a hair plucked. The technology itself is the safest and most effective available, having existed within the medical industry for over 15 years and backed by hundreds of clinical trials. Treatments usually take around 15 minutes. Immediately after your treatment you will see a significant improvement, if not a total eradication, of your broken veins. Many clients can be treated in just one appointment. 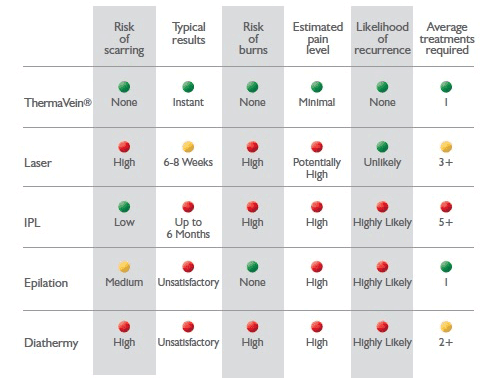 However, for severe conditions you might need more treatments, although it would be unusual to have more than 3 visits as ThermaVein is very effective. Why not book your complimentary thread vein removal consultation and find out how Clinic 33’s skincare specialists can help you? Call 0333 011 0680 or complete the form below.